Mages struggle to probe the mysteries of life, death, time and space. 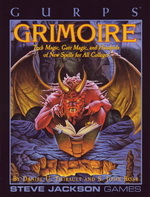 At last, we gather their magical knowledge together – GURPS Grimoire, the ultimate resource for would-be sorcerers and established mages. This indispensable rulebook gives new, powerful spells for all campaigns, from Ice-Age epics to gritty cyberpunk slumcrawls. 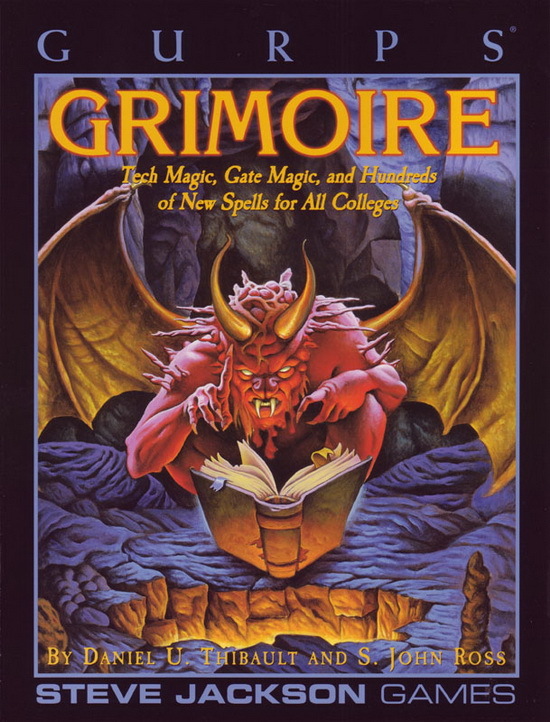 GURPS Grimoire has over 400 new spells, as well as two new colleges. The adventurous – or the desparate – can now manipulate time and space using Gate Magic. Savvy wizards stay current with Technology Magic, and give "machine power" and "rad" entirely new meaning! Several new sub-colleges also add flexibility in dealing with weather, electricity, ice, and acid. This book is completely compatible with the rules in GURPS Magic, Second Edition. Open, then, and learn strange new wonders . . . Already converted to Fourth Edition? You can find everything from this book, and more, in the newest edition of GURPS Magic.